Established in 1986, the National Lacrosse League (NLL) is the leading men’s professional indoor lacrosse league in the U.S. in parallel to what the NBA is for basketball or the NHL for hockey. 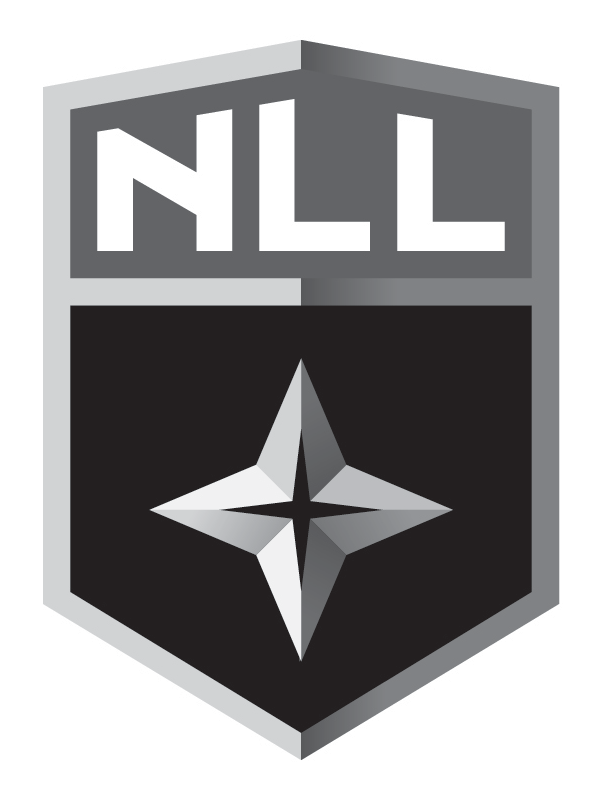 In its official description, the NLL states it “ranks third in average attendance for pro indoor sports worldwide, behind only the NHL and NBA.” The NLL started with four teams and now has nine (five in the U.S. and four in Canada) each playing 18 games during the regular season culminating in a best of 3 championship series. With the new season kicking off this past December and a new live web streaming deal in place, the NLL introduced a new logo designed by Philadelphia, PA-based Brownstein Group. NLL STAR: The logo is anchored by a four-pointed star, an acknowledgement of the four original NLL teams from the Mid-Atlantic region. The NLL Star serves as a guide, something to take the League into the future. It is also evocative of the Native American Morning Star, and pays homage to the roots of the sport and the tremendous influence of that community. NLL SHIELD: A shield wraps the new NLL logo and reflects the warrior spirit of our Native American forbearers and current players, athletes who must exhibit superior strength of mind and body in order to compete at the ultimate level of the sport. CUSTOM COLORS, TYPE & BEVELING: The flexibility in the color palette allows for the inclusion of all teams, offering them a natural ownership of the logo and the opportunity to customize it to their own team colors. The colors are complemented with a modern typeface, something non-standard that matches the inimitable nature of the League. The beveling of the logo adds a final finish, luster and attitude. The metallic sheen is strong, durable and signals that the League will stand the test of time. The old logo was what you would expect from a professional sports league that wants to be seen on par with the premier sports leagues — NBA, NHL, MLB — but for natural causes it just doesn’t measure up in terms of popularity. In other words, it employed the white sports figure dividing a field of blue and a field of red. While the sports figure was acceptable — although it could have also been for the Professional League of Avocado-on-a-Stick Holders — the typography was not. A bookish serif with diamonds… that ain’t gonna sell t-shirts or beanies. The new logo follows the pattern of the MLS, that went from a similar old logo to a more general shield and, for the most part, is an effective transition as the logo looks better. 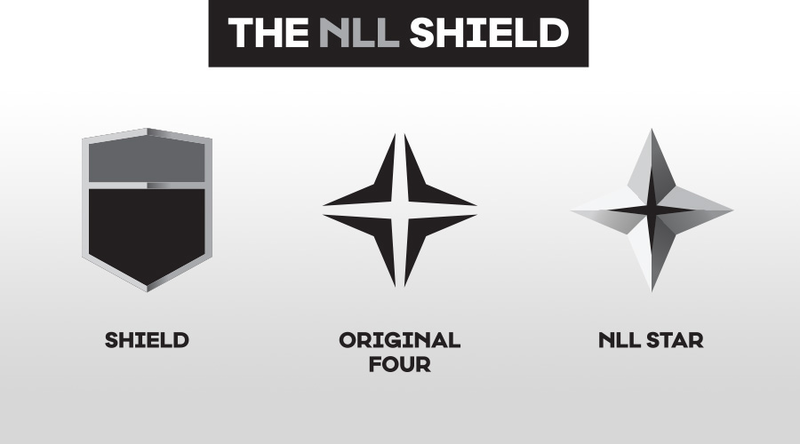 Without the explanation of the original four teams making up the star at the shield’s core, it’s, well, just a star and makes you wonder what it has to do with lacrosse — especially indoor lacrosse, where you never see the stars. Still, as I said, it’s an attractive logo; not great, not bad, but perfectly good. The wordmark works okay as well; I like how they matched the “N”s in the name to the one in the shield and that has enough personality to make the type stand out. The gradient “LACROSSE”… I could do without but I can also see how it helps unify the shield and the wordmark. Shield in the nine team colors. 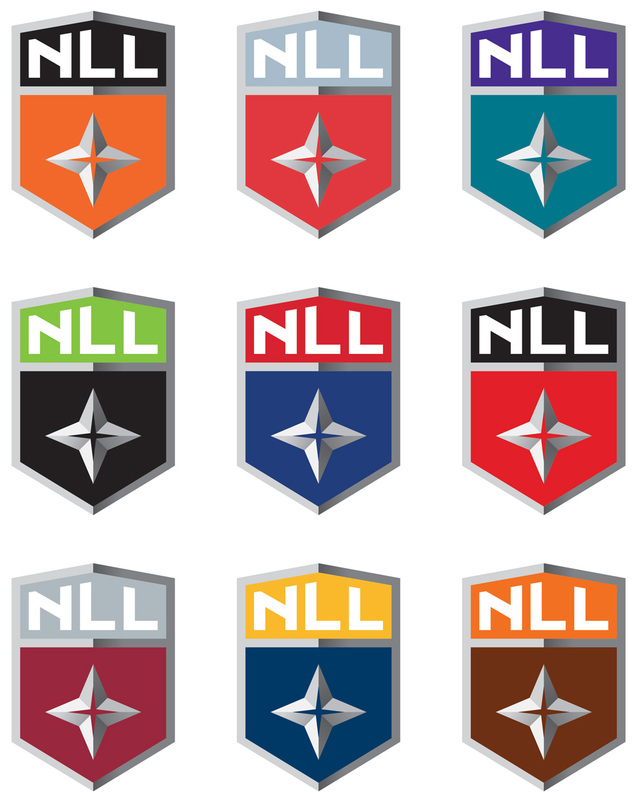 Also, like the MLS, the NLL shield comes in the colors of its teams, which is cute but not as impressive as the 20 teams of the MLS. Overall, the change is good because the old logo really felt old and tried too hard to look professional in a traditional way but — as the rise of its web streaming popularity shows — they don’t have a traditional audience (or sport) and so they needed to break from one sports league convention to another one in hopes of maybe getting a little bit of that soccer magic for themselves. Thanks to Chris Kohanik for the tip. Established in 1986, the National Lacrosse League (NLL) is the leading men's professional indoor lacrosse league in the U.S. in parallel to what the NBA is for basketball or the NHL for hockey. In its official description, the NLL states it \"ranks third in average attendance for pro indoor sports worldwide, behind only the NHL and NBA.\" The NLL started with four teams and now has nine (five in the U.S. and four in Canada) each playing 18 games during the regular season culminating in a best of 3 championship series. With the new season kicking off this past December and a new live web streaming deal in place, the NLL introduced a new logo designed by Philadelphia, PA-based Brownstein Group.